Today I discussed 'sous vide' cooking, or cooking under vacuum, with David Hawksworth of West Restaurant, who uses the method frequently on his menu. This week I discussed my food resolutions for 2006. They include learning how to cook and eat more Italian food, especially Sicilian food, as my grandparents were born there. 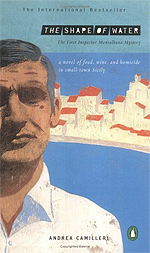 To help, I'm reading some great mystery novels about a Sicilian detective, Salvo Montalbano, who loves food. The first one in the series is called Shape of Water, by Andrea Camilleri.